The college basketball season gets under way Friday with a game at a Europe military base, two more aboard Navy ships and another featuring a reshaped national champion playing in a brand new building. No. 14 Michigan State plays Connecticut, in its first game since the retirement of coach Jim Calhoun, at Ramstein Air Base in Kaiserslautern, Germany. It's the first game between Division I teams held in Europe. Then it's on to the decks for No. 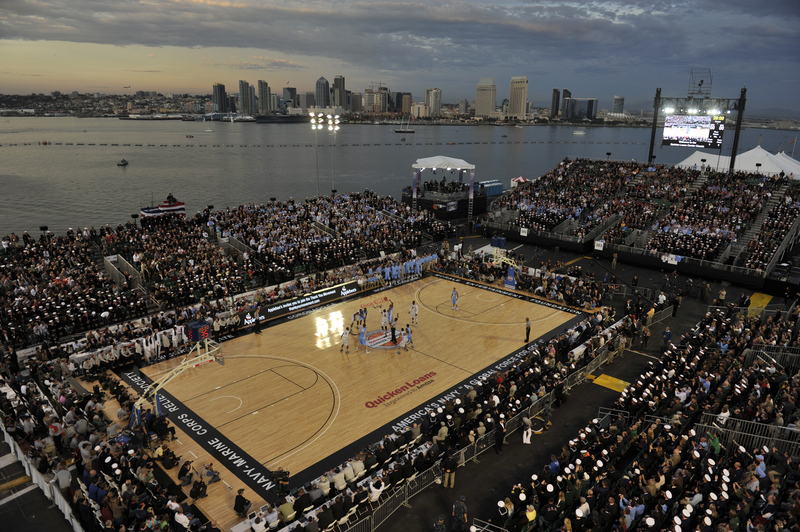 4 Ohio State against Marquette on the USS Yorktown in Charleston, S.C., and Georgetown facing No. 10 Florida on the USS Bataan in Jacksonville, Fla.
CBSSports.com's Jeff Goodman says the military theme can be credited to Michigan State athletic director Mark Hollis. A year ago, he spearheaded the Spartans-Tar Heels gamein San Diego on the USS Carl Vinson - the aircraft carrier that took Osama bin Laden's body to sea for burial. No. 3 Kentucky, the defending national champion with a heralded freshman class, plays Maryland in the first college doubleheader at the new Barclays Center in Brooklyn, N.Y.
Also, one of the sport's shrines reopens. Pauley Pavilion, boosted by a $132 million renovation, will be the site when No. 13 UCLA hosts Indiana State, the alma mater of John Wooden. A statue of Wooden stands outside the north entrance and the corridor on the east side of the 47-year-old arena has been named Wooden Way. Three large cabinets are filled with mementos of the Wooden era that includes 10 NCAA championships  seven in a row  during his 27 years in Westwood. The big opening weekend  21 teams from the preseason Top 25 will have played by Sunday night  will be followed by a month full of early season tournaments. Several special matchups before Christmas will dot the 2012-13 schedule leading into the start of conference play. There will be a third game played on a ship this weekend when No. 9 Syracuse faces No. 20 San Diego State on the USS Midway in San Diego on Sunday. The game will be the first telecast of more than 100 for MSG Network. ESPN will continue its coverage of almost 1,500 games with its annual 24-hour college basketball marathon on Tuesday. Those 12 games, including a 6 a.m. start for Stony Brook at Rider, an 8 a.m. tip for Northern Illinois at Valparaiso and a 10 a.m. start for Harvard at Massachusetts, are part of the 54 the network will show during a six-day stretch. Early matchups between ranked teams include Michigan State against No. 7 Kansas and then No. 8 Duke facing Kentucky in the doubleheader in Atlanta that caps the 24-hour marathon; No. 23 Wisconsin at No. 10 Florida; and the Battle 4 Atlantis that involves No. 2 Louisville, Duke, No. 15 Missouri and No. 17 Memphis. Four months of conference, nonconference and in-season tournament games all point to Selection Sunday on March 17. The NCAA tournament ends three weeks later with the Final Four in Atlanta's Georgia Dome.